Frieda Loves Bread: Instant Pot 7-1 Price Drop in time for Christmas! 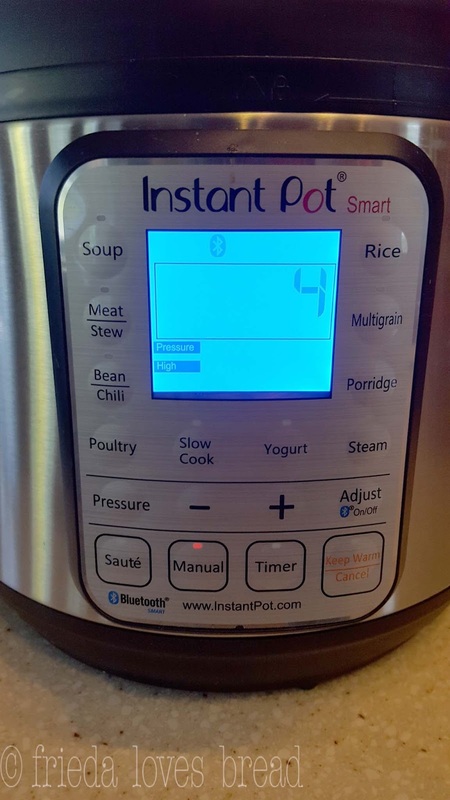 0 Instant Pot 7-1 Price Drop in time for Christmas! Amazon has the Instant Pot 7-1 for $79 and free Prime shipping! Just in time for Christmas, and the earlier Black Friday price was $68.95, so this is a good deal! If you have ever thought about trying out pressure cooking, now is the time. 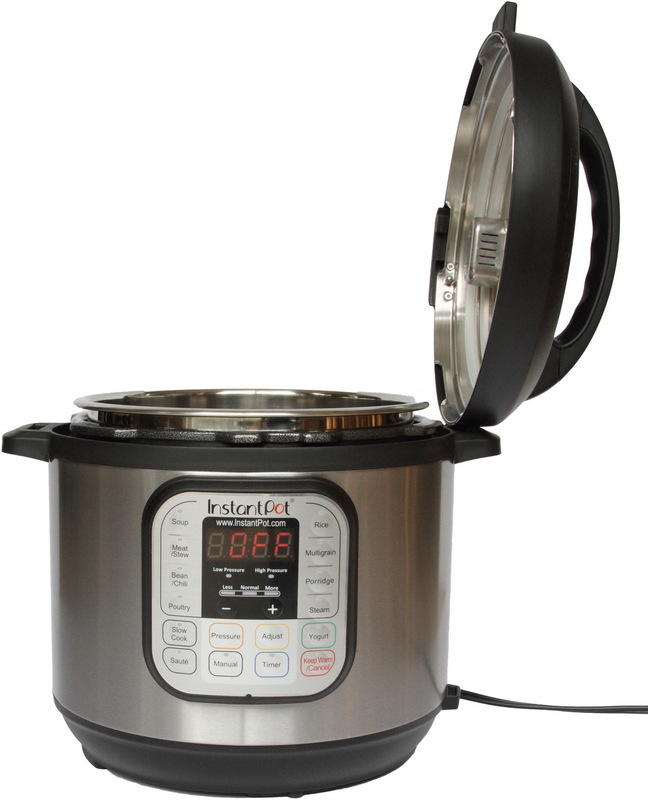 Electric pressure cooking is safer and easier than ever. Think of it as a 'crock pot on steroids.' 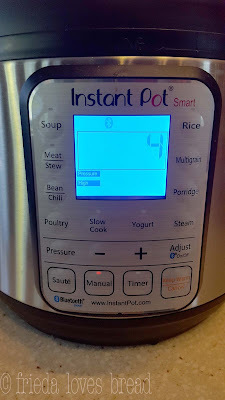 The reason I purchased an Instant Pot is because you can make yogurt in it, without using pressure. I make thick, creamy yogurt in this machine twice per week. You can make a little, or a lot. You can make your yogurt a regular consistency or super thick, like cream cheese. You can make it taste very mild, or mouth puckering tart. It takes only 10 minutes of hands on time to make yogurt, and the Instant Pot does the rest over night, while I sleep. 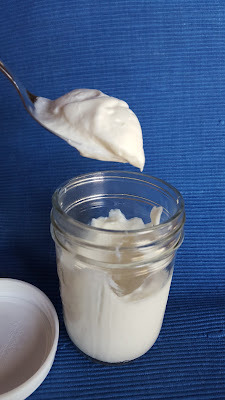 I wake up to warm yogurt that is ready to strain in the fridge and 3 hours later, it's perfect with a little bit of sugar and vanilla extract. A thermometer and yogurt strainer come in very handy when making yogurt. There are some pre-set buttons, but mostly, I use Saute, Manual (high pressure and low pressure), and the yogurt settings. Many recipes you find here and elsewhere will tell you to use high pressure 95% of the time and tell you how many minutes to set your cooker. The DUO 7-1 and the Smart both have low pressure, which I use for hard boiled eggs that peel like a dream, seafood, and delicate veggies, like broccoli. 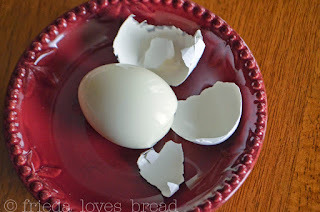 Easy to peel Hard Boiled Eggs ~ even if Farm fresh! 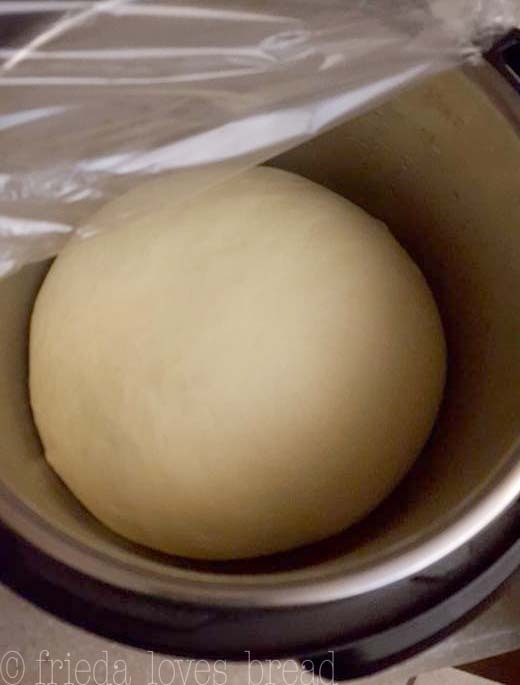 For Thanksgiving, I was able to proof dough for 4 dozen soft, buttery, Dinner Rolls in my Instant Pot! 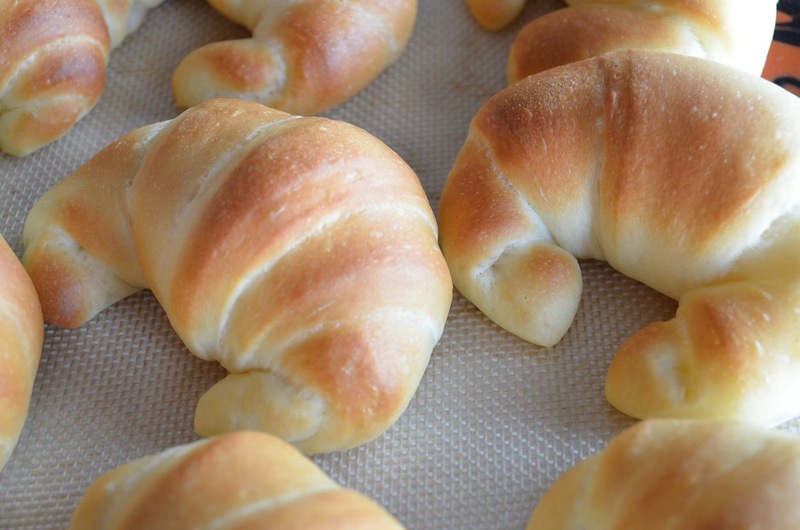 There are 3 yogurt settings and the lowest one is the perfect temp for raising bread. In the past, I only used my pressure cooker for mashed potatoes and veggies, like carrots. 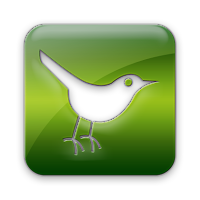 Now I'm cooking up Sunday Pot Roast, making Chocolate cheesecake, One Pot Spaghetti, Creamy Mac N Cheese, Salmon, and much, much more. Even Kettle Popcorn! 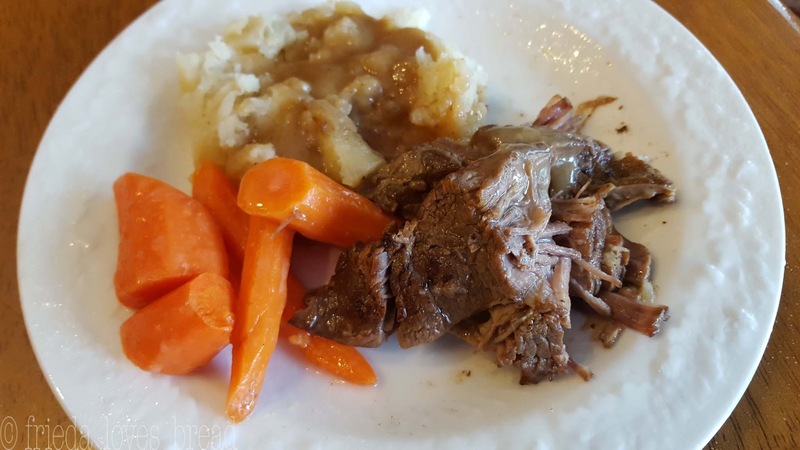 Tender Roast Beef, Potatoes & Carrots ~ all in the Instant Pot! So, TODAY only, for a limited time on Amazon, the price for the Instant Pot Duo 7-1 6 quart is $79, For Prime Day in July, it was $69.99. Black Friday this year, it was $68.95. So, now is the time to buy one. 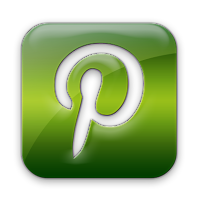 You can purchase through my affiliate link, which does not cost you anything, and by doing so, I receive a very small commission, which I put back into this blog, researching recipes, testing them out and putting them here for you to enjoy. 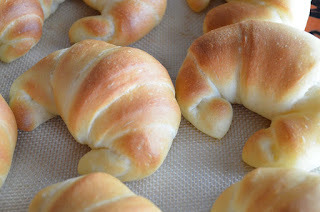 Thank you for being loyal readers and supporters of Frieda Loves Bread for the past eight years!